When you consider how much space is occupied by windows on a commercial building, you realize the large opportunity that exists to market your business. Compared to advertising in newspapers, radio, TV or billboards, using window graphics is a relatively inexpensive way to get your message across to a large number of people. For example, onsite signage is equal to two dozen full-page newspaper ads every year. Plus, you can change the look of your windows and what you want to convey to passersby whenever and however you want. Frosted – Frosted windows have a multi-layered effect. Since they’re difficult to see through, the frosted window graphic creates an air of mystery and may cause people on the street to become curious and venture inside. If used by a restaurant or café, the effect may be cozy and warm. In office settings, frosted windows convey security, which is ideal for financial institutions, insurance companies, medical offices and more where privacy is important. Window Perf – Window perforated film is highly versatile and can be used to create a wide variety of images and letters in different sizes and colors. They can cover an entire window with an image or just part of a window with lettering. By covering the entire window, the perforated film may act as a billboard or picture frame, depending on the size of the window. Using smaller images or lettering allows your message to pop while providing a view inside for potential customers to observe what you are selling. Using high-resolution images and/or lettering help catch the eye and convey your business’s intended message. Window Clings – Typically small, window clings are often used as signs that adhere to windows with static electricity. This makes them easier to remove than decals, which use an adhesive to stick. Because they are designed to be easily removed, window clings are ideal for advertising limited-time offers at restaurants or sales on retail shop windows. 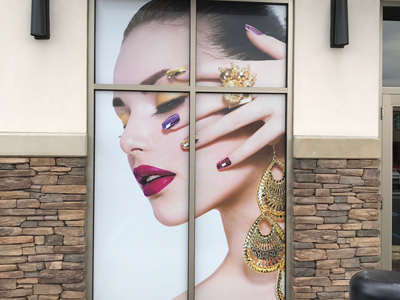 By decorating your business’ windows with strategic messaging and images, you turn just a few transparent surfaces into one of your biggest marketing tools. SpeedPro Imaging can help your business stand out from the rest with our multiple products for window graphics. Our window graphics are customized to meet your needs. We’ll even ask you if the graphic should be “first surface,” which means it would be placed on the outside of the window looking out, or “second surface,” which means it would be placed on the inside surface of the window looking out. To learn more about SpeedPro Imaging and how we can get your business noticed with window graphics, check out our products and services.